BACKGROUND AND PURPOSE: Aneurysms have been clinically and experimentally treated with various surgical and endovascular methods, including endovascular polymer instillation. Additional tools may help to identify advantages and disadvantages of polymeric aneurysm treatment. We assessed the value of high-resolution videography to compare in vitro embolization characteristics of ethylene vinyl alcohol copolymer (VIN), cellulose acetate polymer (ACE), and urethane copolymer (UCO). METHODS: In a “neck-up” glass aneurysm model, solutions of 8% and 12% VIN, 8% and 12% ACE, and 8% UCO were introduced through a microcatheter into a xanthan gum solution at three flow rates: full physiological (62 cm/s), half physiological, and flow arrest. Each formulation was then introduced into a “neck-down” aneurysm model at flow arrest, for a total of 20 experiments. Results were tabulated for six different categories: outflow tail formation, inflow-zone polymer-mass deformation, inflow-zone migration, detachment tail formation, adherent mass pullout, and conjectural net effect. RESULTS: Of the 20 experiments, nine had unacceptable results because of potential clinical complications. The results were unacceptable in four of eight VIN experiments, four of eight ACE experiments, and one of four UCO experiments. VIN performance was more dependent on flow arrest than the more viscous ACE. The growth of the ACE solutions was most circumferential, with balloonlike growth characteristics, little inflow-zone effects, and fewer outflow tails than seen with VIN. All compounds had the potential for partial catheter adhesion and catheter-adhesing tails. UCO had the highest percentage of favorable results and the lowest percentage of unfavorable results. CONCLUSION: Videographic analysis allows detailed assessment of the dynamic embolization characteristics of polymers, revealing potential advantages of compounds such as UCO. Several technical and clinical approaches are used to treat intrcranial aneurysms: altering aneurysm inflow streams (1), closing the aneurysm neck (2, 3), or inducing intraaneurysmal clotting (4–8). Altering inflow with high-density stents that bridge the aneurysm neck, for example, can interrupt the fluid flow patterns that may help maintain aneurysm patency. The aneurysm neck can be closed by pinching it off with a surgically placed clip or by placing a covered stent across the aneurysm neck in the parent vessel. Finally, the aneurysm lumen can be modified to promote clot formation and secondary closure, such as with endosaccular coiling (9). These three categories can be broadly thought of as rheologic alteration, neck closure, and thrombogenic promotion. We introduce a method using high-resolution videography to refine the analysis of polymeric substances in vitro. We compared the dynamic embolization characteristics of three intravascularly solidifying polymers that can be used for aneurysm embolization. The preliminary, nonvideographic in vitro impression of these substances was that they behaved in a similar manner. Our comparison was performed to assess the potential clinical utility and ease of use of these polymers. These substances may be used for primary aneurysm polymeric embolization, adjunctive coil therapy, adjunctive stent therapy, or adjunctive clip therapy. We evaluated these polymers in a glass aneurysm flow model, and compared the aneurysm embolization characteristics in the most favorable hypothetical conditions. In vivo clinical considerations include specific gravity and flow-related issues, gravitational dependence in addition to flow arrest, polymerization characteristics with full physiological flow, and nondependent or partially neck-down aneurysm positioning. We tested three groups of compounds: an ethylene vinyl alcohol copolymer (VIN), a cellulose acetate polymer (ACE), and a urethane copolymer (UCO). VIN and ACE have been previously used in a variety of formulations with mixed success (4, 5, 10, 11); UCO has not enjoyed a similar degree of popularity (12, 13). The aim of this study was to evaluate the value of high-resolution videography in assessing polymer instillation in a variety of concentration strengths and flow states, with the additional comparison of the urethane copolymer compounds described. Various physical formulation differences have been previously described when evaluating these substances. UCO tends to form fragmented, particulate flow columns and can be quite viscous; VIN tends to grow as cauliflower-like nodules; and ACE has a tendency to solidify as strings when injected into a static solution. All three of these compounds have specific gravities greater than water and blood, and sink in flow arrest. Five liquid embolic formulations were created: 8% and 12% VIN, 8% and 12% ACE, and 8% UCO (Micro Therapeutics Inc, Irvine, CA). These formulations were created as weight-to-volume solutions in 10 cc of dimethyl sulfoxide (DMSO) with 35% 5 micron Tantalum added to make the solutions radioopaque. 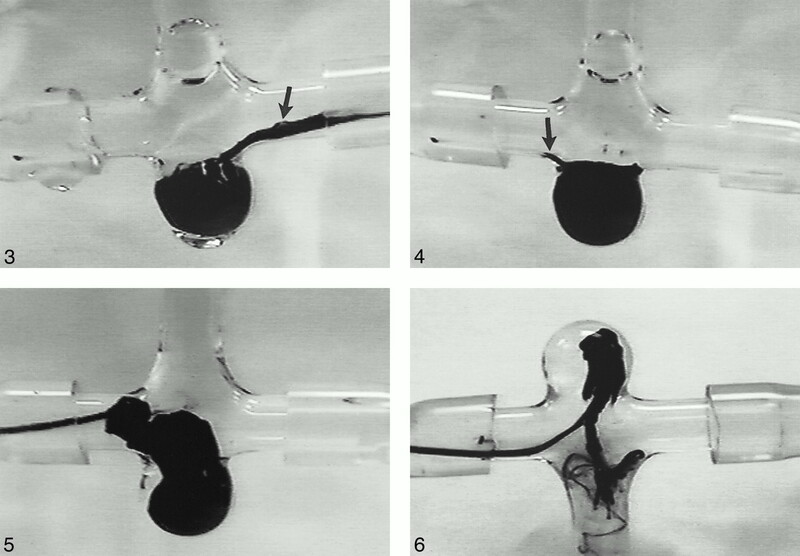 These solutions were introduced into a single-lobe blown-glass aneurysm model placed on a roller pump with systolic-diastolic flow variance, resulting in 6 cc/s (120 cc/min) of flow at full physiological rates, and into 3.5-mm diameter glass tubing, resulting in a flow velocity of 62 cm/s at stated full physiological flow. This was accomplished with mean pressures of 75 mm of mercury, measured inline with dampened sinusoidal flow, in an effort to approximate physiological flow near the circle of Willis. The aneurysm is a side-wall 8-mm spherical glass aneurysm with a 5-mm diameter neck. These dimensions were chosen to allow inflow and outflow in spite of a catheter entering the aneurysm neck. The flow-circuit fluid is a previously described shear-thinning elastic fluid, consisting of a 0.0375 wt % xanthan gum solution in distilled water (14). High-resolution filming was performed using a Hi-8 Nikon videoscopic macro camera at maximum filming rate. The microcatheters used for injections were specially fabricated 2.7F catheters (Micro Therapeutics Inc, San Clemente, CA) with polyethylene hubs. Injections were performed in gravity-dependent, or neck-up, position at each of three flow rates: full physiological uninterrupted flow, half physiological flow, and complete flow arrest. Subsequently, the model was inverted so that all formulations could be introduced into the aneurysm model in the nondependent, or neck-down, position with full flow arrest. Each of these four conditions was imposed on the five tested formulations; therefore, 20 separate experiments were performed. The specific injection protocol consisted of inserting the catheter into the aneurysm followed by priming injections of normal saline. The catheter dead space was then filled with DMSO as a catheter preparant and, finally, the polymeric solution was added using 1-mL polyethylene syringes. The volumes of introduced solutions were 5 mL of saline, followed by 0.2 mL of DMSO, and then 0.5 mL of polymer to fill the 0.5-mL catheter dead space. The catheter and polymer were then considered prepared, and the polymer was positioned close to the distal tip of the catheter. By use of gradual injection, subjective assessment of the ongoing embolization was performed by the operator. The inflow-zone morphology must be watched carefully; there will continue to be a small amount of polymer injected into the aneurysm even if pressure on the syringe plunger is released, caused by polymer viscosity and slight elastic expansion of the catheter. This method attempts to duplicate those that would fill the aneurysm in vivo, while attempting to avoid aneurysm overfilling (Fig 1). At the appropriate time, manual polymer injection is ceased. Because the polymer is not a tissue adhesive, there is much less concern for catheter adhesing than there is with liquid adhesives such as cyanoacrylates; the solidified polymers can contact the catheter and will not stick to it as tenaciously as an adhesive would. Therefore, if a long segment of catheter is not “buried” in the polymer, the polymer can be left in contact with the distal tip of the introducing catheter indefinitely prior to catheter retrieval. After embolization is completed, gradual catheter suction is performed while the catheter is retrieved (Fig 2). An example of neck-up aneurysm positioning with flow arrest. The polymer, 8% VIN, enters as a continuous, gravitationally dependent layer that fills the aneurysm. 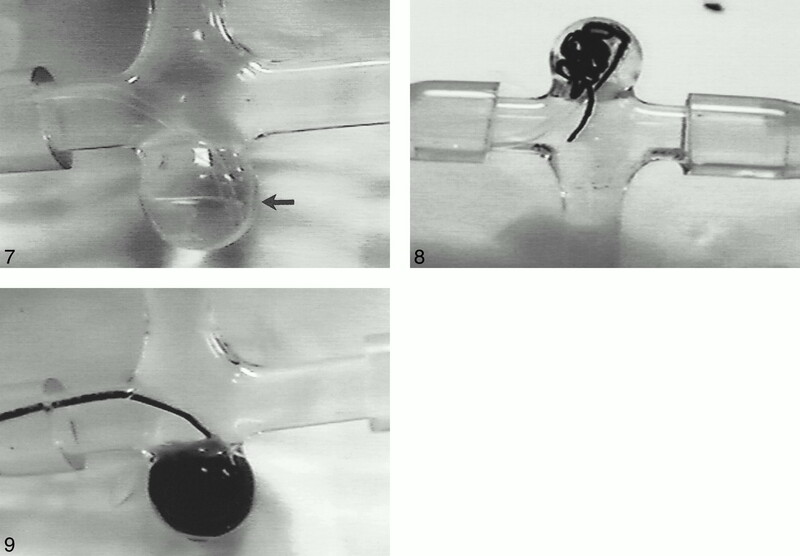 This example highlights the significance of placing the aneurysm in a gravitationally dependent position for embolization when instilling heavier-than-blood polymers.fig 2. A and B, After there is adequate aneurysm filling with polymer (A), gentle suction is applied to the introducing catheter to detach it from the polymer (B). Optimally, there is uncomplicated catheter retrieval without significant detachment tail formation or polymer mass retraction/displacement. In this example, a small residual aneurysm remains (arrow), and there is parent vessel luminal encroachment with partial pullout of the polymer mass during detachment. 1) An outflow tail was defined as absent, small (< 3 mm), or large (> 3 mm) (Fig 3). The tail forms when a solidifying strand of polymer extends from the outflow portion of the aneurysm, and projects into the parent vessel. A small outflow tail was defined as a tail shorter than half the apparent aneurysm neck width. Absent tails were given a value of zero, small tails a value of one, and large tails a value of two. 2) Fluids enter the aneurysm in a focal zone known as the inflow zone. As fluid flows from the parent vessel into the aneurysm, it has a tendency to displace or compact the filling polymer at the inflow zone. This finding may imply a lack of aneurysm cure. The inflow-zone deformation site was evaluated as either absent, small, or large. A small inflow deformation site was defined as a polymer displacement or depression, with the inflow pocket measuring less than 25% of the aneurysm depth; a large inflow deformation site was defined as a pocket measuring greater than 25% of the aneurysm depth. Absent inflow-zone deformation was given a value of zero, a small deformation was given a value of one, and a large deformation was given a value of two. 3) Inflow-zone migration refers to displacement of the inflow deformation site or pocket, upstream or downstream of the parent vessel, during embolization. This implies a significant alteration in the aneurysm filling characteristics, and may be a harbinger of thrombosis. It implies a change in the inflow-zone location and, therefore, a change in the transmural aneurysm pressure and potential rupture characteristics. Lack of inflow-zone migration was given a value of zero, and presence of inflow-zone migration was given a value of one. 4) A detachment tail is a strand of polymer that solidifies in the catheter and is adherent to the initially intraaneurysmal solidifying polymer mass. As the catheter is pulled back to disconnect it from the aneurysm polymer mass, an adherent detachment tail can extend into the parent vessel. The size of the detachment tail is defined as absent, small, large, or, in its extreme form, mass adherent. A small detachment tail was 3 mm or less, shorter than half the width of the aneurysm neck (Fig 4). A large tail was greater than half the aneurysm neck width in length (> 3 mm), and a mass adherent tail resulted in at least partial displacement and retraction of the embolic mass into the parent vessel. Absence of a detachment tail was given a value of zero, a small detachment tail a value of one, a large detachment tail a value of two, and a mass adherent tail a value of three. 5) An additional category was created to address further loss of polymer into the parent vessel. The polymer may be lost as fragmenting particles floating downstream into the parent vessel, or as masses of intraaneurysmal polymer pulled out of the aneurysm with the microcatheter; both are undesirable (Figs 5 and 6). 6) A summary category was used to assess the overall result of attempted embolization. This net result was categorized as acceptable, poor, unacceptable, or hazardous. Unacceptable results were defined as greater than 50% transluminal parent-diameter encroachment or total withdrawal of the polymerization mass into the parent vessel. This resulted in either an undesirable significant parent-vessel native-flow compromise, or a potentially hazardous large-vessel polymer embolus. A poor result was a greater than 20%, but less than 50%, transluminal parent-vessel diameter encroachment or a loss of introduced polymeric material in the form of fragmented particles. The hazardous category was applied to experiments in which the catheter not only adhesed to the single large embolic mass, but removed it entirely from the aneurysm and into the parent vessel. These experiments were considered hazardous because the polymer masses stayed firmly attached to the catheter in spite of full flow, potentially serving as a hazardous large polymer embolus (Fig 5). An acceptable result was tabulated for the remainder of the cases. Rather than implying clinically protected or cured aneurysms, the acceptable category was applied to aneurysms at least 70% filled. The videographic evaluations are tabulated in the Table. There were six acceptable results, two with UCO, three with ACE, and one with VIN. There were ten unacceptable results, five with VIN, four with ACE, and one with UCO. There were two hazardous results, one with VIN and one with UCO. Videographic assessment in the neck-up experiments revealed initial layering of DMSO, which was seen as separate from the circulating solvent, as it entered the aneurysm (Fig 7). As the polymer, which has a higher specific gravity than the DMSO, was introduced, the DMSO formed a layer on top of the polymer, and could be lifted by the polymer level into the parent vessel. In neck-down aneurysm experiments, the DMSO did not layer in the aneurysm because it has a higher specific gravity than the circulating solvent and, therefore, rapidly entered the parent vessel. Distinct layering of the gravity-dependent DMSO (arrow). DMSO diffuses through biologic tissues at uncertain rates; layering is clearly seen in this aneurysm model, which is impermeable to DMSO, that may not be seen in biologic systems.fig 8. A continuous embolic string, seen in only one case with an 8% UCO solution. The leading point of the embolic string was unfortunately carried out of the aneurysm by the outflow zone, although clear string compaction occurred even during the early phase of the string mass coiling.fig 9. An unfavorable observation made with the UCO mixtures was a “smoky” fragment layer of polymer particles at the interface between the polymer mass and the parent-vessel fluid. These particles may ultimately embolize distally, with unknown fluid embolic complications. A subjective assessment of the injections showed that, for similar concentrations, the VIN solutions were least viscous (requiring less manual injection pressure), UCO had greater viscosity, and ACE had the greatest viscosity. The less viscous solutions showed a greater dependence on flow arrest and dependent positioning, as expected. A viscous solution, which has a high tendency to stick to itself and form a single cohesive mass that grows diametrically (similar to a balloon), may appropriately or inappropriately confer high operator confidence during aneurysm embolization when introduced into an aneurysm that is positioned neck-down and is being embolized without an interruption or decrease in physiological flow. Additionally, with the more viscous solutions, anticipating the amount of polymer stored in the elastically distended catheter was more difficult than with the less viscous solutions. Specifically, once injection syringe pressure ceased, the operator identified a greater amount of continued inflow when compared with less viscous solutions. In our experiments, the relatively low-viscosity VIN showed more dependence on flow arrest than the more viscous ACE. On reestablishing flow in the arrested models, there was also greater inflow deformation of the VIN than the ACE polymer. The UCO showed fragmentation and particulation characteristics more completely than the other four formulations, and the growth characteristics of the two ACE solutions were the most circumferential, or balloonlike, with diametric polymeric expansion, little inflow-zone effects, and slightly shorter outflow tails than with VIN. All compounds had the unfavorable characteristics of partial adhesion and adhesing tail formation with respect to the delivery catheter. Outflow tails were seen in four of eight VIN, five of eight ACE, and one of four UCO experiments. Each polymer showed at least one case of a large outflow tail; this was a greater problem with the more dilute solutions. Nonetheless, outflow tails were not seen in three of the four UCO experiments. Additionally, inflow-zone deformation was not seen in three of four UCO, three of eight VIN, and three of eight ACE experiments. Inflow-site migration occurred more often with the more dilute solutions. The tenacity of the detachment zone was assessed by examining the detachment-tail and pullout rates. VIN had the most large detachment tails, with sporadic formation seen with UCO. Additionally, there was greater than 50% pullout in one of four UCO, four of eight ACE, and six of eight VIN experiments. One unacceptable UCO result was tabulated. In that case, the experiment was performed at full physiological flow and, rather than solidifying as a single growing polymeric mass, the polymer formed multiple small fragments during instillation and the entire mixture traveled downstream. Finally, neck-down positioning yielded unacceptable results irrespective of embolic mixture, highlighting the need for neck-up positioning. The 8% UCO solution showed an interesting in vitro “stringing” appearance in the neck-down experiment, which was not seen with any of the other tested formulations (Fig 8). This result was duplicated upon reevaluation, ascertaining that it was not based on poor or inconsistent catheter preparation with solvent. Rather than forming a single large clumping polymeric mass, the UCO formed a string of polymer as it exited the catheter end, gradually filling the aneurysm lumen. This characteristic may be related to cohesion/tension and surface-skin characteristics, viscosity, and neck-down positioning. The neck-down aneurysm position may result in a low intraaneurysmal DMSO concentration and cause the polymer to pull away from the catheter tip, because of specific gravity, rather than sit in a puddle at the tip of the catheter. In addition to small in vivo series evaluating the ease of use of aneurysm polymers, a number of polymer aneurysm embolizations have been performed in clinical series that included as many as 12 acutely ruptured aneurysms treated in a single series with ACE solutions (10, 15, 16). As we have demonstrated, there is difficulty in controlling the polymeric conglomerate even in favorable laboratory conditions of complete aneurysm dependence and flow arrest for prolonged solidification. Prior experimental models using DMSO revealed significant vasospasm and inflammatory changes in the rete mirable and craniocerebral vasculature of a swine model after infusions of doses doubling or tripling those used for catheter preparation, raising the issue of DMSO-related inflammation. There is a safety margin, because the in vivo doses used for polymerization-catheter preparation are less than one third of the doses shown to consistently cause inflammatory changes (5). Certain physical characteristics of polymer solutions played a role in our selection of concentrations and aneurysm model positions, specifically, viscosity and specific gravity. Although higher polymer weight-to-volume solutions can be created, they are not very practical for transcatheter application, because of the excessive viscosity of the concentrated doses. It is advantageous to introduce the liquid polymers into the aneurysm with flow arrest, and with the aneurysm in a gravity-dependent position. Our two-position, neck-up and neck-down, model was used to assess whether it was necessary to place a human aneurysm in dependent position when treating primarily with a polymer. Unfortunately, it is not always clinically practical to place the aneurysm in a dependent position; it is necessary, therefore, to judge the effects of DMSO layering into or washing out of the aneurysm as well as the specific-gravity layering of the polymer to assess optimal use of these tools. In addition, there may be a small amount of polymer injected into the aneurysm after pressure on the syringe plunger is released, caused by slight elastic expansion of the catheter. Our method attempts to duplicate the in vivo methods that would fill the aneurysm, while avoiding aneurysm overfilling. Because the polymer is not a tissue adhesive, there is much less concern for catheter adhesing issues than with liquid adhesives such as cyanoacrylates; the solidified polymers can contact the catheter, but will not stick to it as tenaciously as an adhesive would. Therefore, as long as the operator avoids burying a long segment of catheter in the polymer, the polymer can be left in contact with the distal tip of the introducing catheter for several minutes prior to catheter retrieval. The ACE polymer is marginally superior to the VIN polymer in terms of favorability of embolization, and has growth characteristics after injection that are most appealing when successful. Nonetheless, ACE viscosity and adhesion characteristics cause an unacceptable number of polymer-mass pullouts, making consistent successful embolizations difficult. The stringing appearance seen with a single injection composition of UCO may offer certain embolic benefits that have yet to be elucidated (Fig 8). The UCO solution had the highest percentage of acceptable polymerizations and the lowest percentage of unacceptable polymerizations, as judged by videoscopic analysis. Nevertheless, generation of a fine-fragment boundary layer (Figure 9), which could cause undesirable distal parenchymal embolization, is cause for concern. 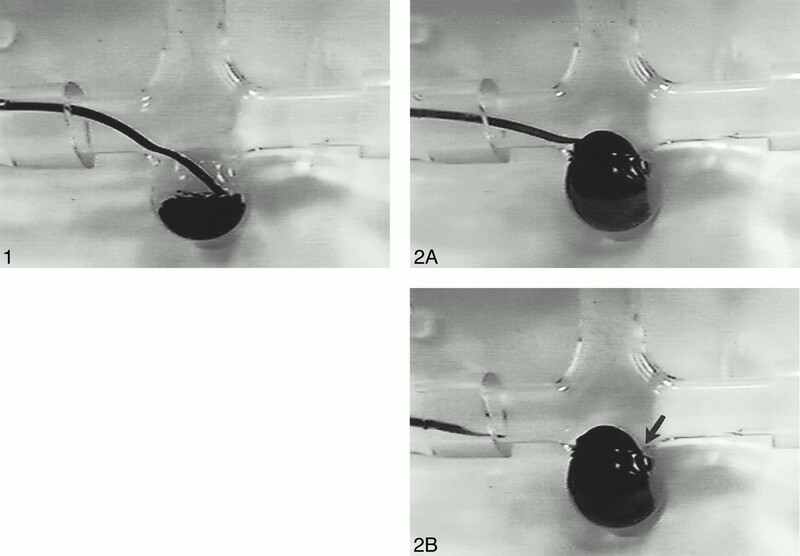 In one UCO experiment (#17), with full physiological flow in a gravity-dependent position, the polymer completely fragmented and washed out of the aneurysm. The experiments discussed herein are limited examples, and do not take into account many variables encountered in clinical practice. Rather than pointing out the absolute merit or value of these polymeric solutions, our intention is to demonstrate the added value of using high-resolution videoscopic analysis in the determination of advantages and disadvantages of such formulations. Rapid-speed and high-resolution videographic analysis of three families of polymeric substances evaluated in vitro for aneurysm embolization uncovered a number of otherwise unsuspected variables in polymerization behavior. Therefore, such analysis may serve as a valuable tool to decrease the in vivo learning curve, and help to refine selection and implementation of new endovascular tools and techniques. This may especially apply to assessment of liquid embolic agents. In spite of the inherent advantages of in vitro experimentation, such experiments are limited, especially by the large number of variables involved. These include the various advantages of Newtonian and non-Newtonian fluids, high and low shear-rate analysis, the use of inelastic and elastic wall models, and the biologic and inflammatory variables for which nonorganic models are unsuited (14, 17–21). In spite of high viscosity and catheter adhesion tails, the predictable circumferential growth, lack of inflow-zone deformation, and lack of outflow-zone tailing reveal that properly selected polymers hold significant clinical potential for aneurysm embolization. Further research and development should be directed at decreasing delivery-catheter adhesing and tailing, seen with all three polymeric compounds, and decreasing boundary layer fragmentation, seen with UCO. The greatest single variable contributing to suboptimal results was the high catheter-polymer adhesion; this may be addressed by catheter and catheter tip modifications including detachable tips, customized catheter tip coatings, and catheter tip valves. Methodical and standardized videographic analysis of endovascular tools, such as liquid embolic agents, with in vitro models highlights significant issues that may significantly impact their clinical assessment and utility. ↵1 Address reprint requests to Alexander M. Norbash, M.D., Department of Neuroradiology, Brigham and Women's Hospital, ASB1, L1, Room 015, 75 Francis Street Boston, MA 02115. Accepted after revision June 27, 2000.